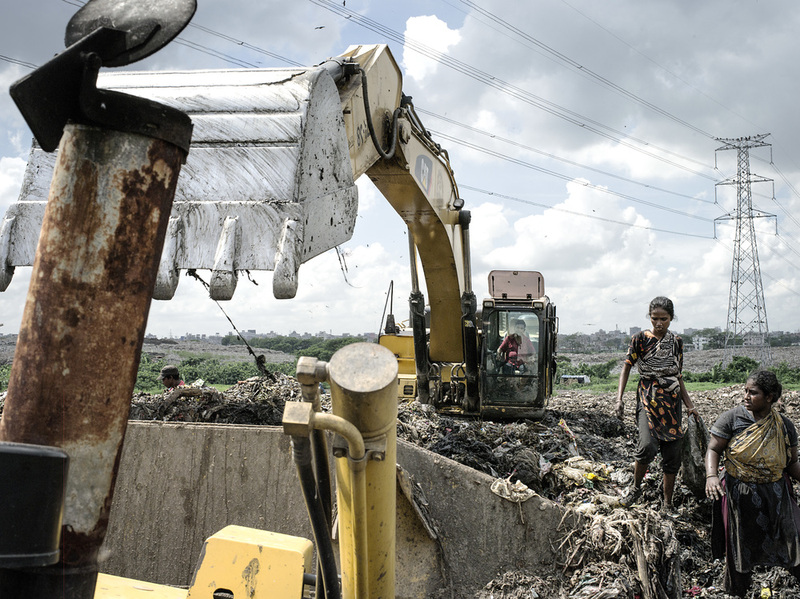 Matuail Landfill is Bangladesh's largest landfill located in the capital city of Dhaka. One year ago I was researching my next landfill project. I thought looking into the world’s most densely populated countries would be a good start and Bangladesh was one of the countries towards the top of that list. Bangladesh became an independent country from Pakistan in 1971. 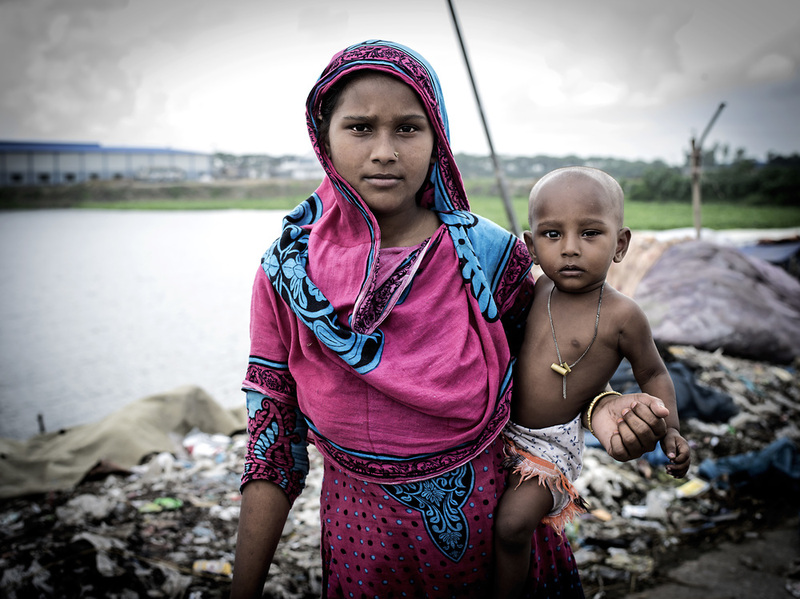 Since then the population of, Bangladesh has increased 300-fold. 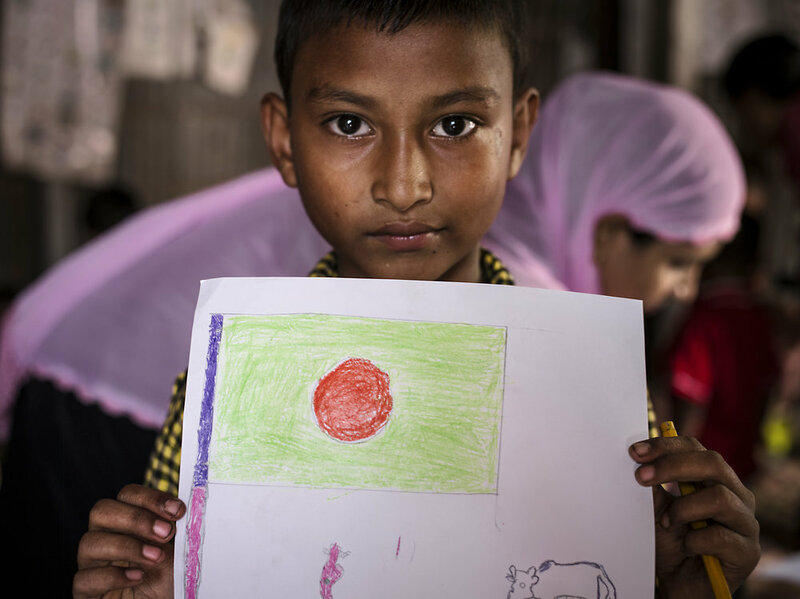 Today, 156.6 million people call Bangladesh home, and 15 million of them live in the 325 sq. km area of Dhaka. 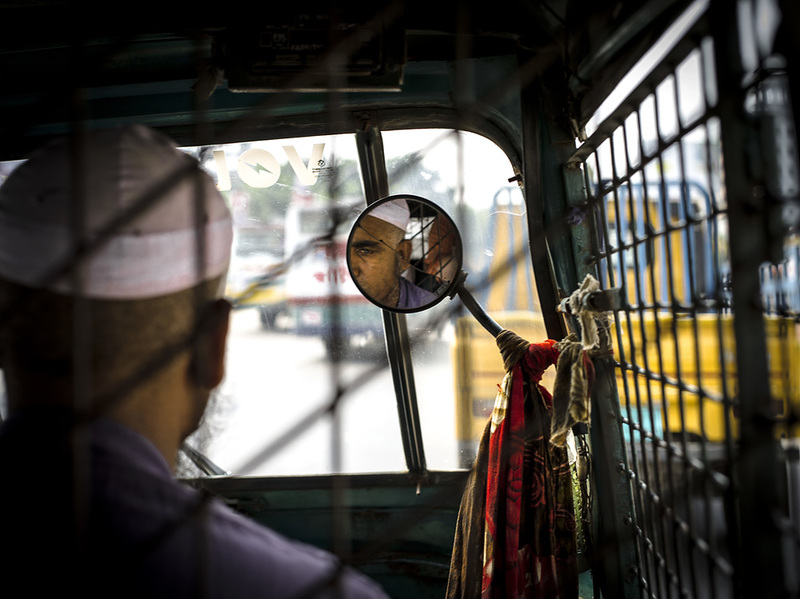 15 Million people live in the 325 sq km area of Dhaka City. I booked my trip far in advance of my departure and I did not realize that I had booked it at the same time as a major holiday, Eid al-Adha. 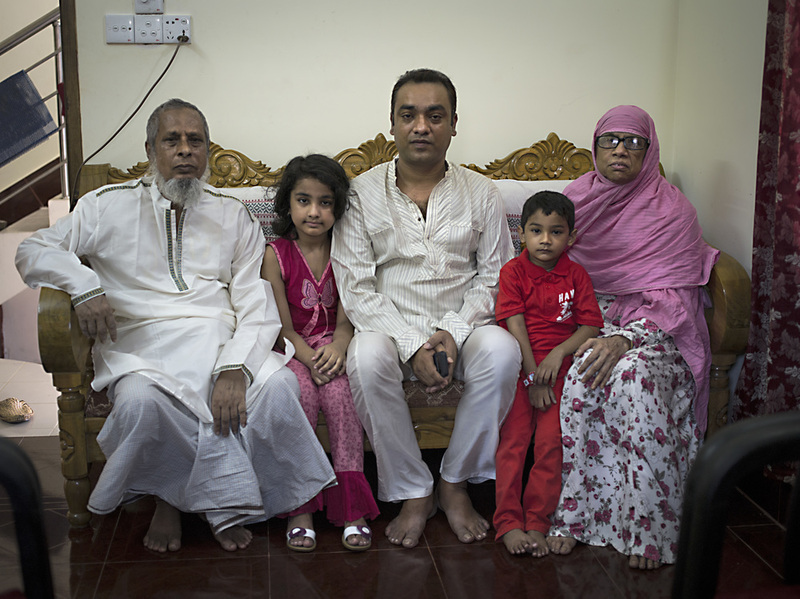 Over 90% of Bangladesh is Muslim and this publically recognized holiday meant that families would be at home and the country would not be in its natural busy state. 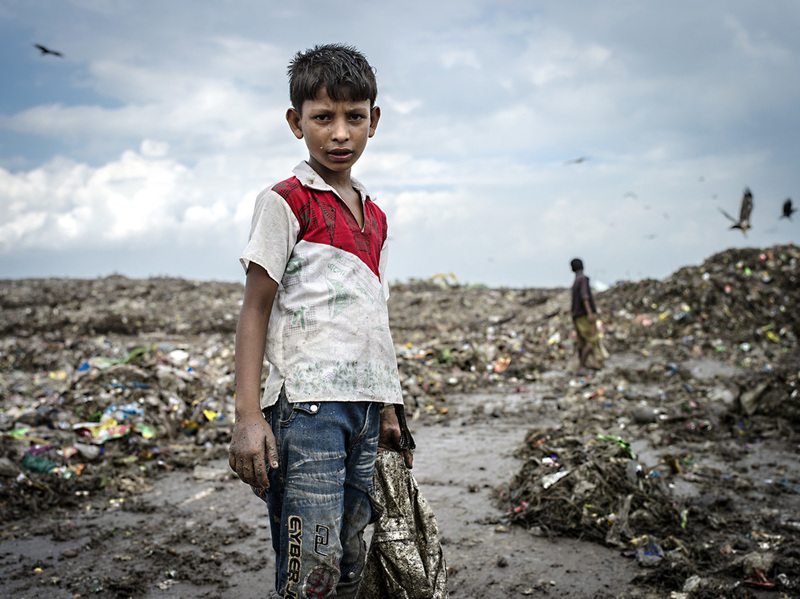 There is a landfill in Guwahati City, India that I intended to visit and figured I could use this time to travel there. When I went to the airport no one was working to sell me a ticket and I could not book online either. Luckily, a friend was heading to his home on the border of Bangladesh and India for the holiday, so I took a detour and decided to slowly get to India by ground. My friend lives in Sylet and suggested that I stay with him until the major part of the holiday was over. Even though I was enjoying myself with new friends and new places, the urge to photograph began to grow stronger. The people in this town stared at me as some admitted to having never seen a white person. My friend has 55 cousins, so you can imagine I had a lot of people to meet. Each person was as nice as the next and they were very excited for the holiday and to include me. 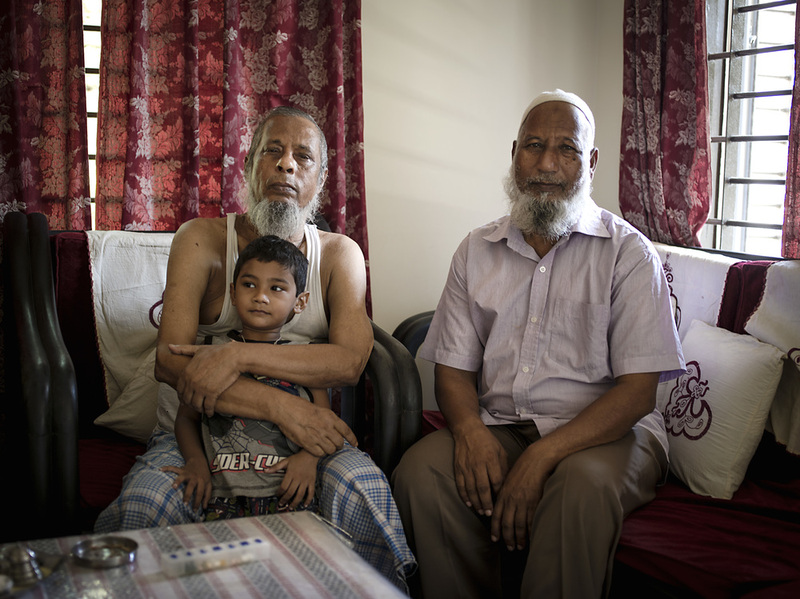 They explained that Eid al-Adha is a feast of a sacrifice. Farmers bring in their biggest cows to be sold to a family. A family will usually buy 1 or 2 cows for $300 to $800 per a cow. The cows are then taken to their homes while the families go to pray at Mosque. After they return, a few helpers are hired to sacrifice the cow. The killing of the cow is done in a very orderly way. It requires specific knives and prayers to go along with the event. 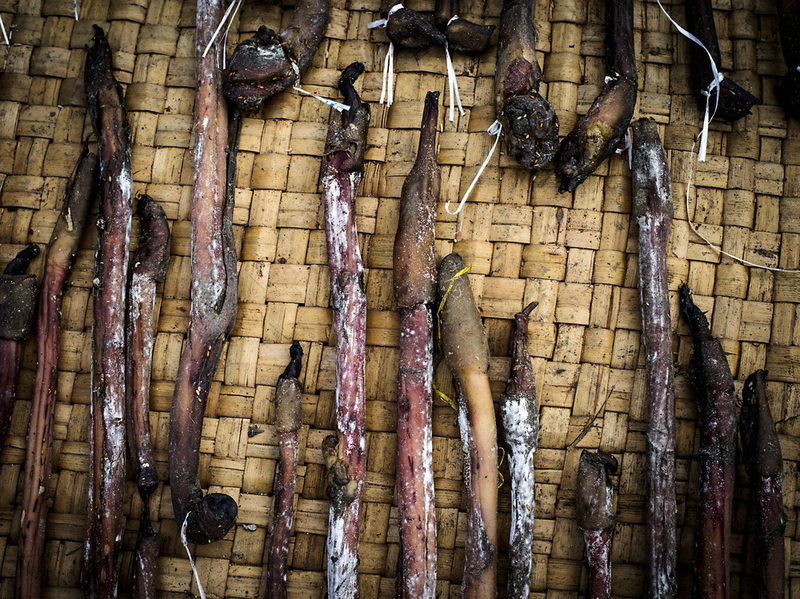 As a Westerner, I found this very interesting and began to photograph the process. I soon realized that every part of this cow is recycled. I felt grateful for the opportunity to document the original state, and its future incarnation. Another major purpose of this holiday is for families who are able to afford to buy a cow. 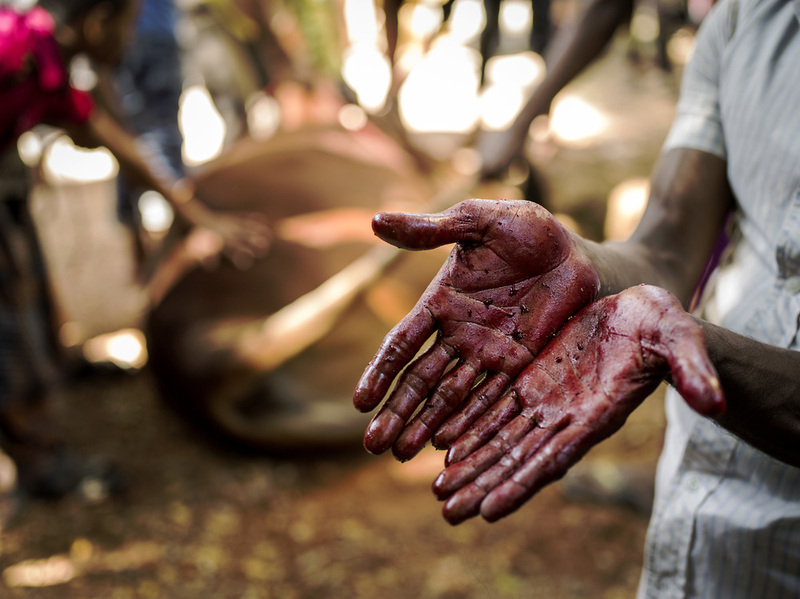 They have the cow stripped down of all of its parts and the very best meat is distributed to the poor. The second best parts are shared with the community and the remainder is for the family itself. 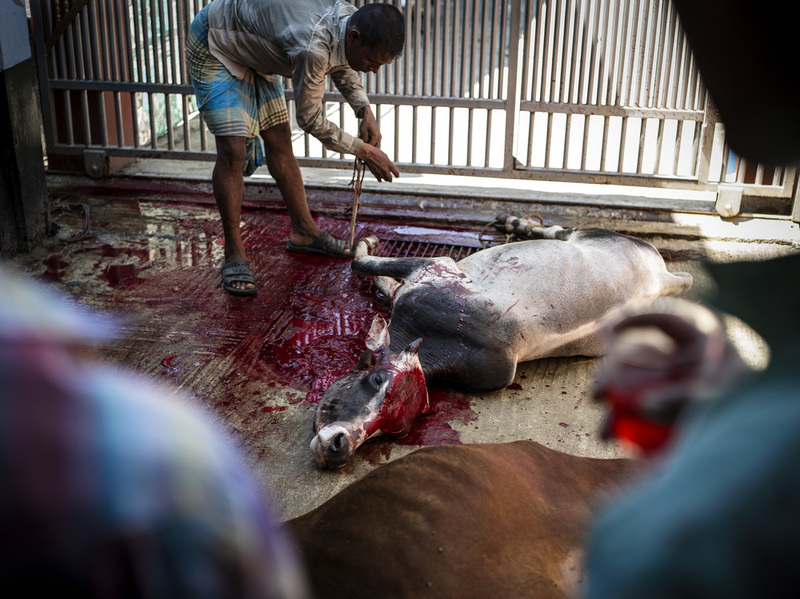 Approximately ten million cows across the country are sacrificed on this particular day, one million in Dhaka City alone. Quite the opposite is true next door in India. Cows are worshipped there as a Hindi symbol of all living creatures and life. They are considered sacred and therefore should not be killed. But of course there are people migrating their cows for money to contribute to Eid al-Adha. As long as their cow was not killed by them or in their country, they are willing to sell their cows over the border. 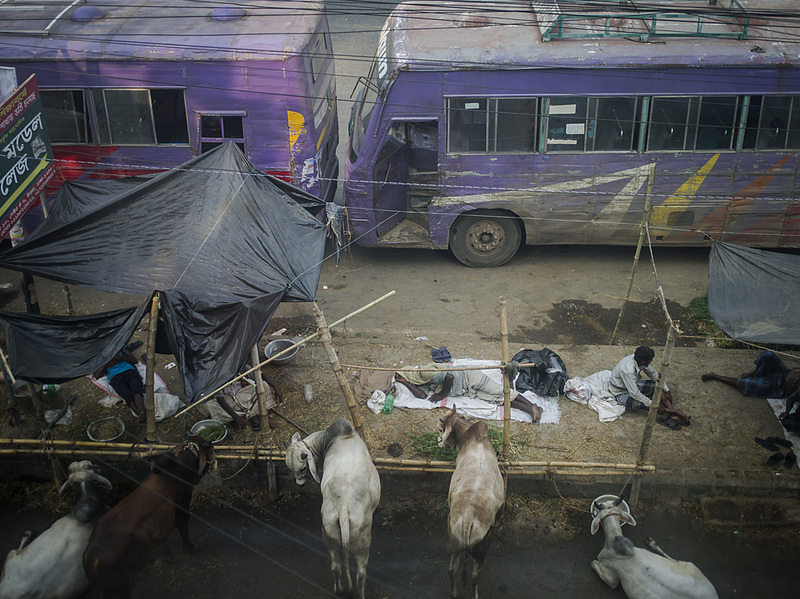 After the meat is given to everyone, there are piles of cow skin on the sides of all the roads. 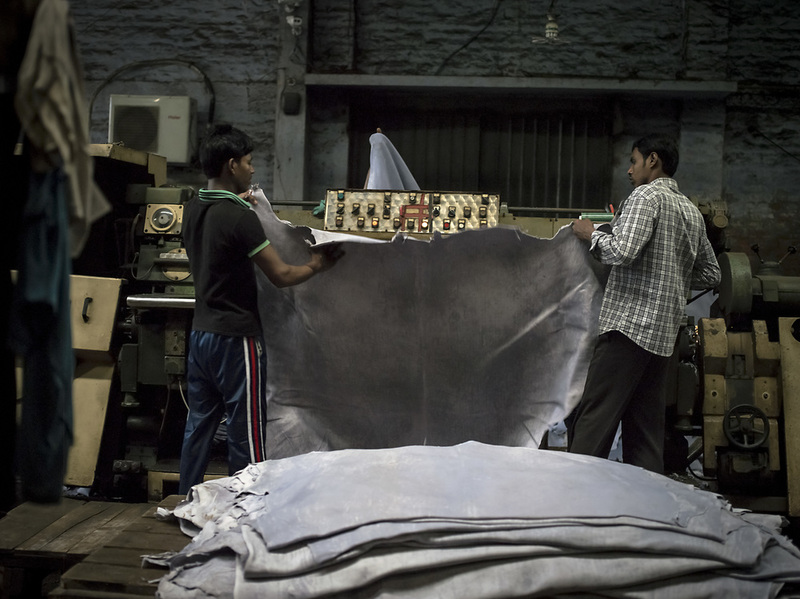 These skins are sold to someone who collects them and brings them to a tannery where they are converted into leather. 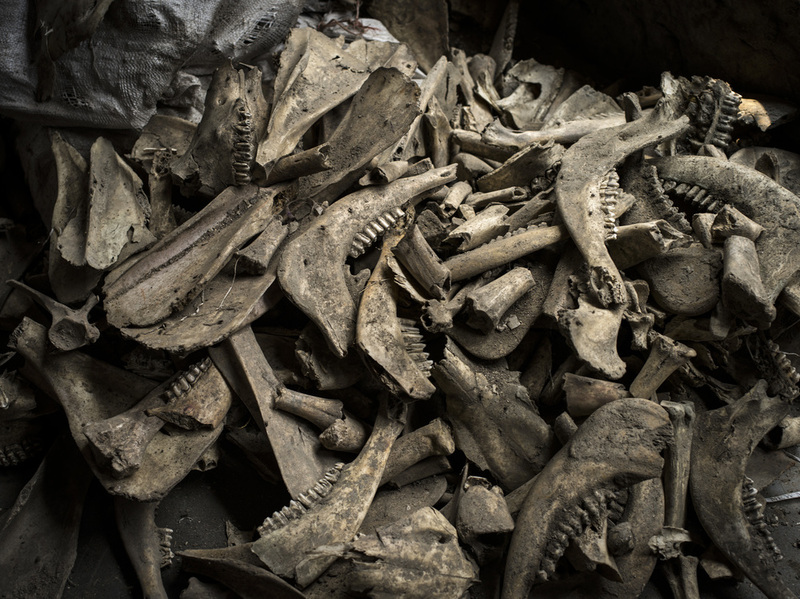 All of the bones of the animals make it to a bone mill where they are crushed into tiny pieces and shipped to India. Those bone fragments are then converted into gelatin, which can be used to make medicine capsules, gelatin-based desserts, preservation for fruit and meat, powdered and many other things. Also the penises of cows are collected and used to make surgical suture for sewing wounds together. Essentially, every part of the cow has been re-purposed. 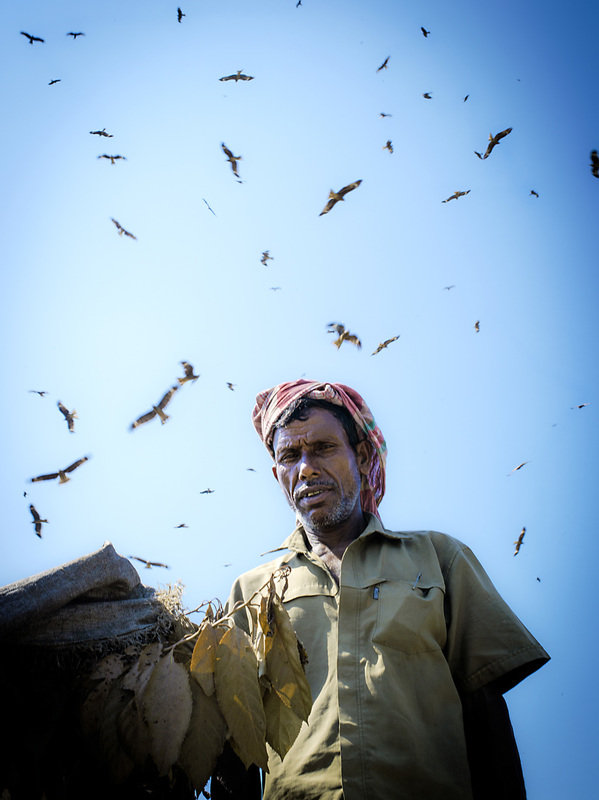 While I was visiting Sylet, I was able to explore their local landfill called, Parar Chokh. On our way there, I discovered the largest mountain of plastic bottles I have ever seen. My curiosity pulled us over as we proceeded to look for who is in charge. Their operation looked large and organized but there was only one person working. Due to the holiday, everyone was gone, except for Abdur Rahim. 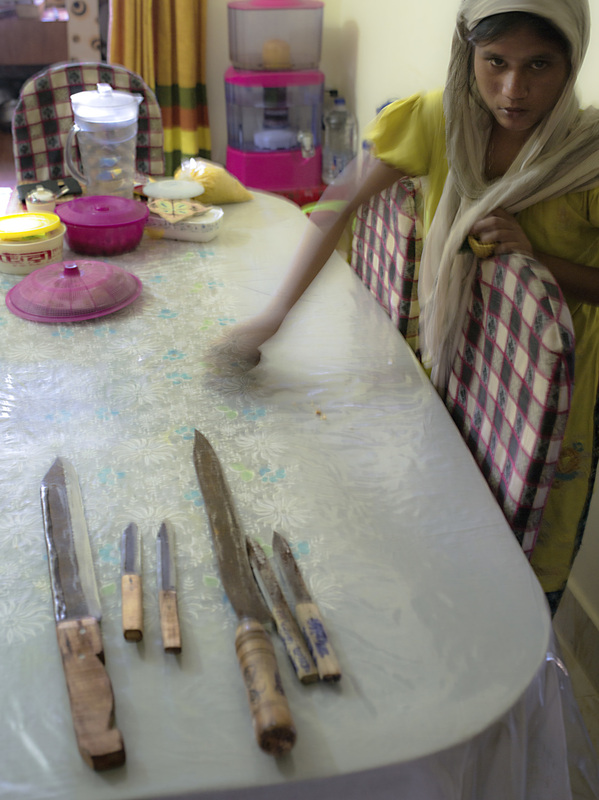 Abdur was sitting on his day off slicing labels off of plastic bottles with a c-curved knife. He explained how this place operates. 40 people work at this space and it is independently run by informal recyclers. They worked together to create this system on their own. They rent out a large structure where people collect plastic and bring it to this facility. 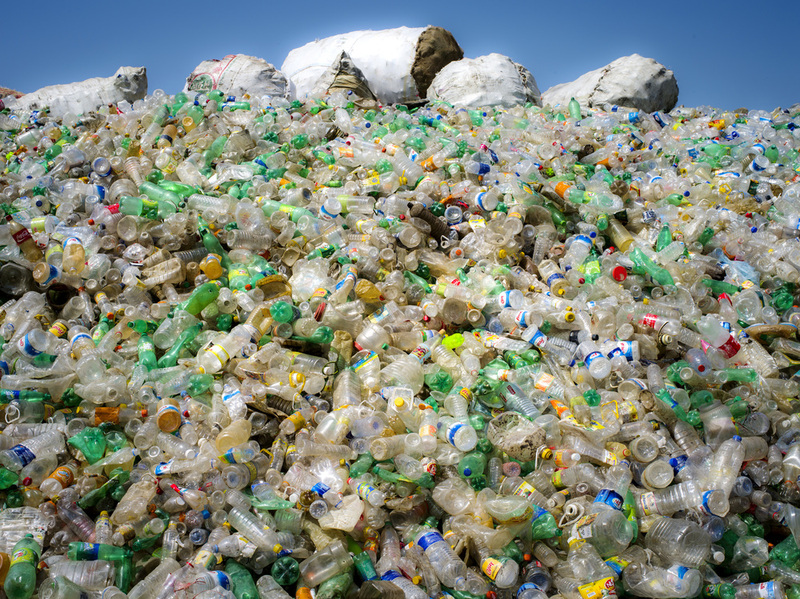 They receive 35 Taka (0.44 cents) per a kilogram of plastic. After they collect the plastic, they rip off the labels and chop it up in a machine to produce smaller pieces. They clean those tinier plastic pieces as they are now more transportable. They are then able to send it to China for another profit. Abdur makes around 9000 Taka ($113.29) a month. 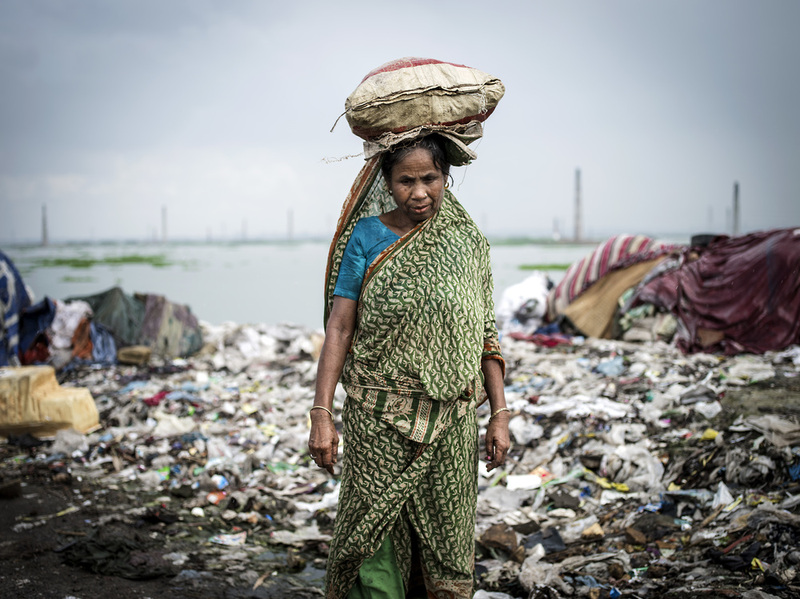 That breaks down to $3.77 a day, which is more then what a waste picker makes in Dhaka City. 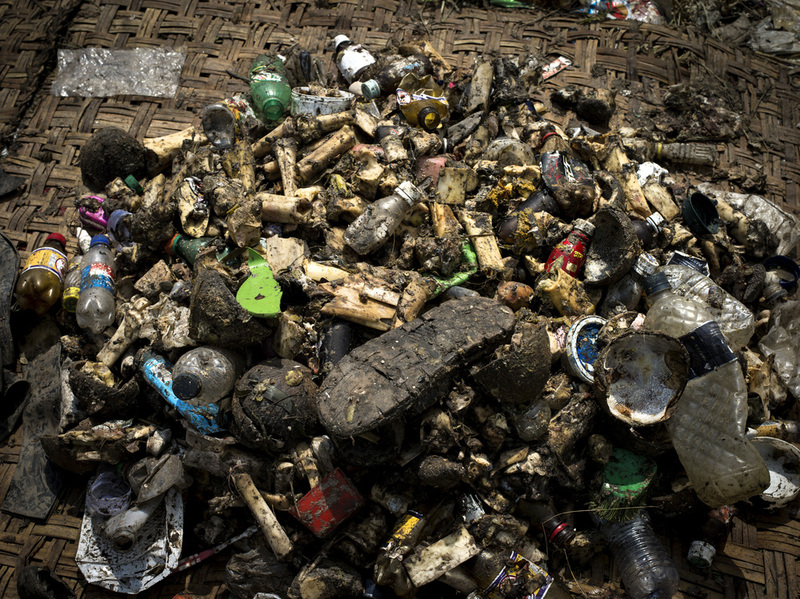 After Eid al-Adha was over I returned to Dhaka to continue reporting the municipal waste situation there. I visited many sites throughout Bangladesh. 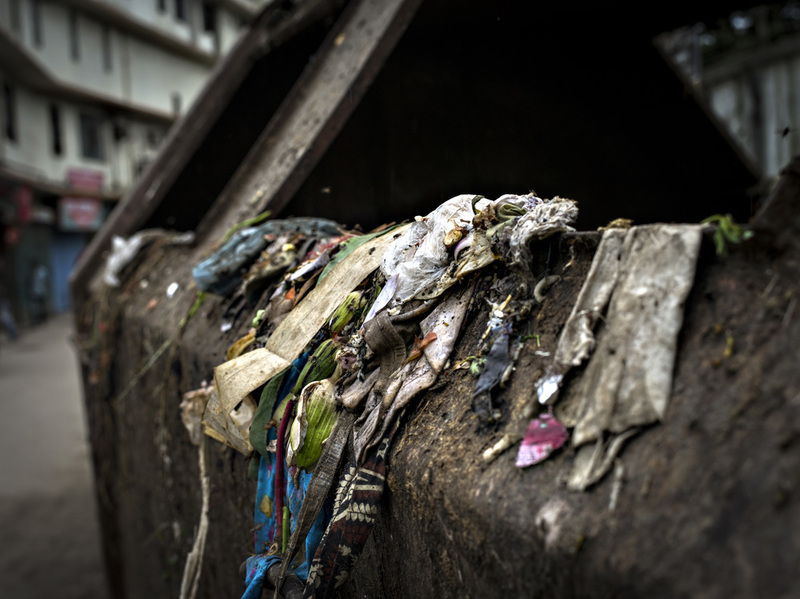 One site was the second largest landfill in the country called, Aminbazar Sanitary Landfill. 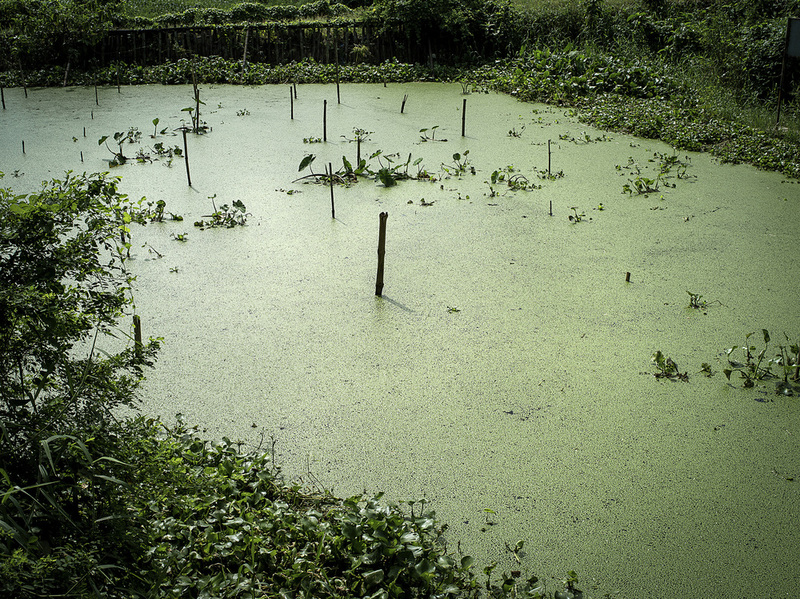 It was surrounded by a body of water with brick kilns in the distance. 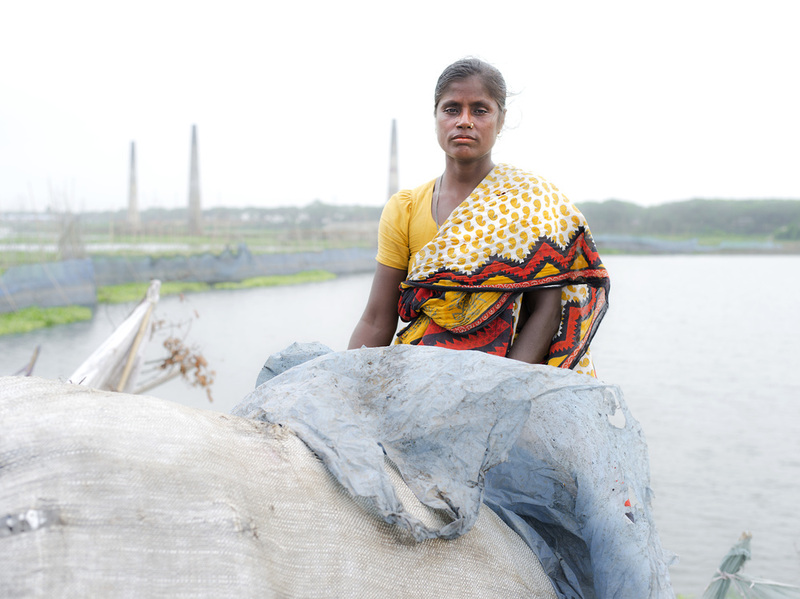 I also visited a city called Narayanganj on the outskirts of Dhaka City where there was a waste dumping area. 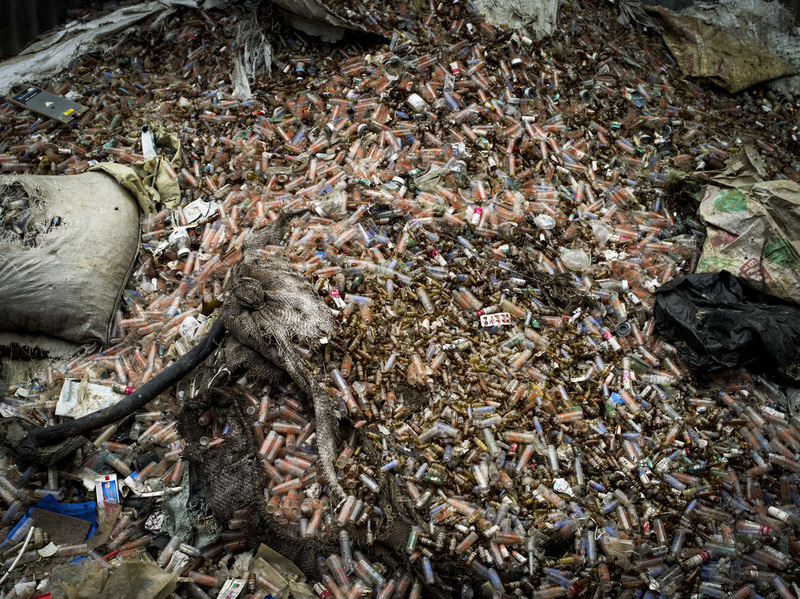 I then visited Bangladesh's largest landfill, known as Matuail Landfill located in Dhaka City. Abdulla Harun of Dhaka South City Corporation explained to me that the landfill is 100 acres large and accepts 40 thousand tons of trash daily. This landfill has become more regulated for a few great reasons. 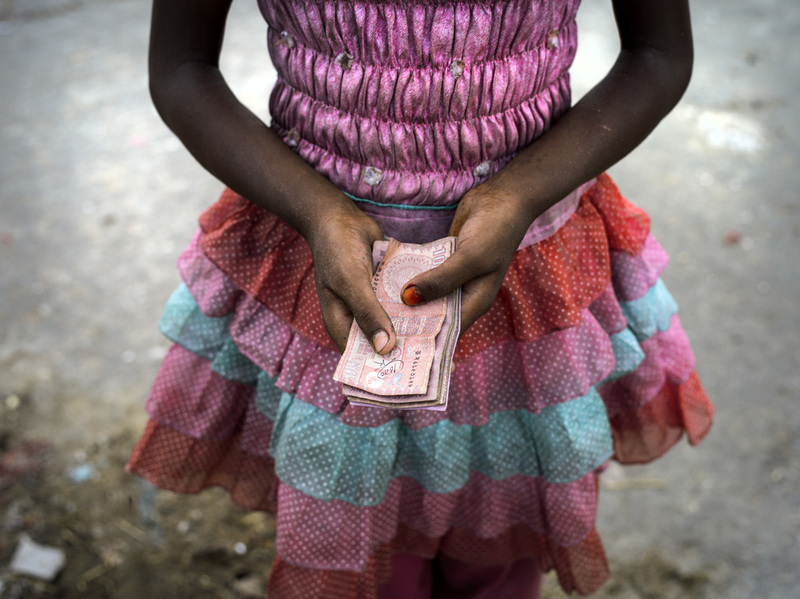 First, the passage of a child labor law that restricts work by any child under the age of 14. When a child approaches Matuail Landfill, they are stopped by a guard and redirected to the local school. Also, a Japanese company, Japanese International Corporation Agency (JICA) is helping to oversee the landfill to make sure that it is operating in an orderly fashion and more recently, unidentified human remains were discovered and that led to heightened security for the landfill. 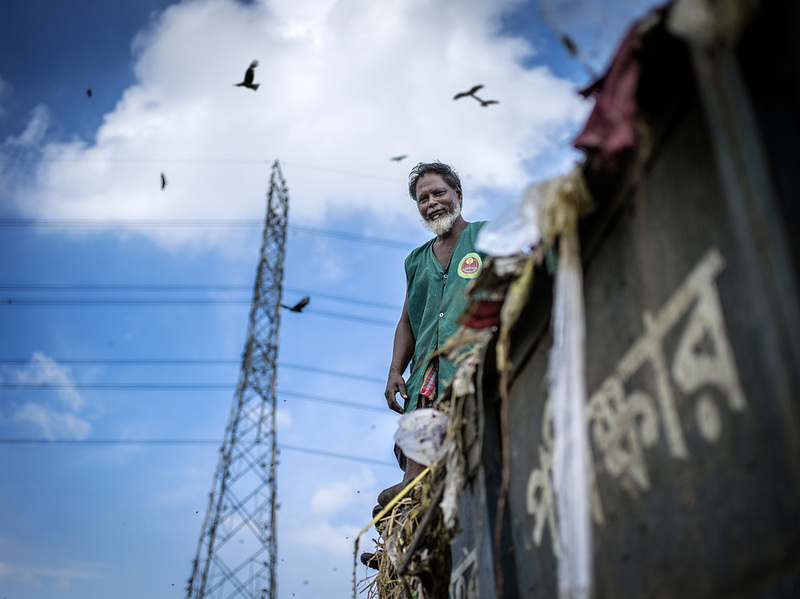 Guards at Matuail Landfill in Dhaka, Bangladesh. I sat down with Director, Maksud A.K.M. and, Project Manager, Reza Khan from the Grambangla Unnayan Committee who are a part of the em[POWER] Energy Group team. They have projects including the Grambangla Nursery and the Grambangla School for the children of informal recyclers, a campaign to provide informal recyclers with better tools and knowledge about safety and health, an environmental section run by informal recyclers and a woman’s waste picking co-op. 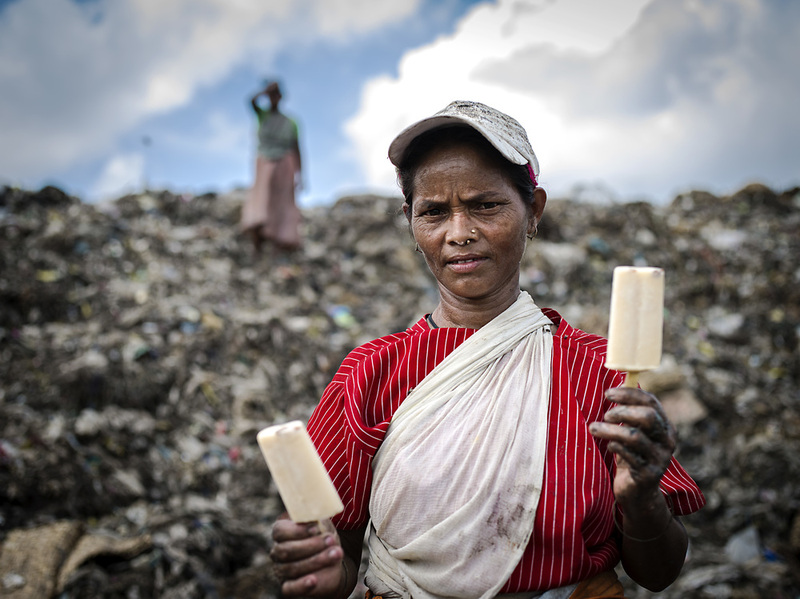 There are 2000 informal recyclers at Matuail Landfill and 75% of them are women. There are always 400-500 informal recyclers in the landfill. 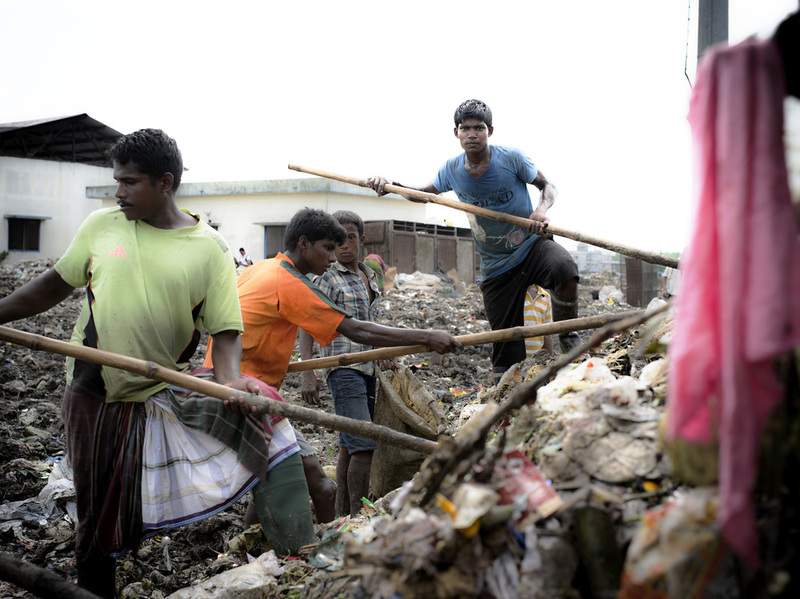 This means that a informal recycler will work a 12 hour shift while a family member rests, and then the ‘rester’ replaces the worker, and the cycle continues, so most families have someone working in the landfill at all times. There are times when people need a few days off to rest because the working conditions are very harsh. One waste picker can make 150-200 taka ($1.89-$2.52) in one day alone. If the family has a shanty next to the landfill, then they are required to pay 50 Taka a day for rent to keep their space. Children who attempt to enter the dumpsite are stopped by the guards and directed to the small local school. When I first looked into the landfill, it was hard to imagine what could possibly be valuable enough there for thousands of people to become so reliant on it. 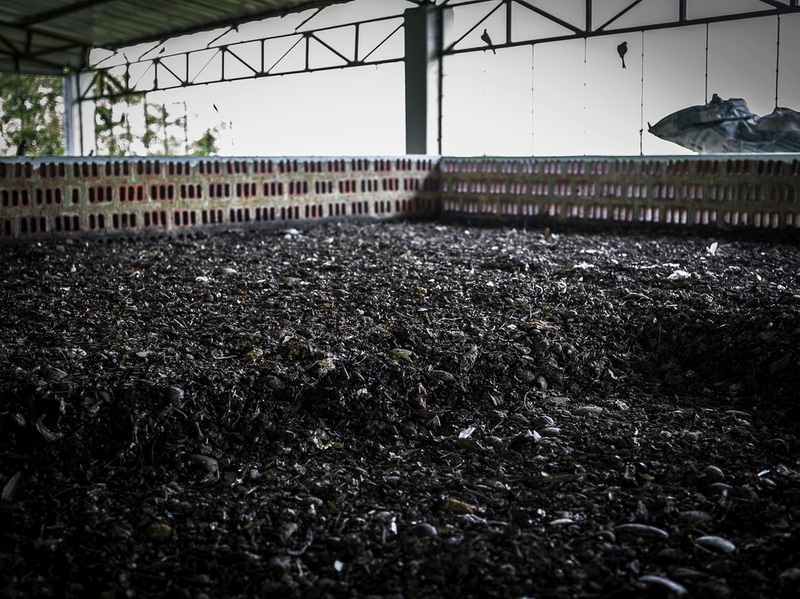 A closer look at the piles they extract from the trash, revealed pieces of plastic, bones, and rubber soles. It’s not much but it proves how resourceful these people have become to survive. What comes into this landfill appears to be mere scraps because there are about 2000 small depositories throughout the city and trash is collected in different regions and dumped into these large sized dumpsters. Often, people have already picked the more valuable items out of these containers before they are brought to the landfill. This makes a majority of the Matuail Landfill organic waste. I remember the landfill was very mushy and the methane was so strong that it stung my eyes. 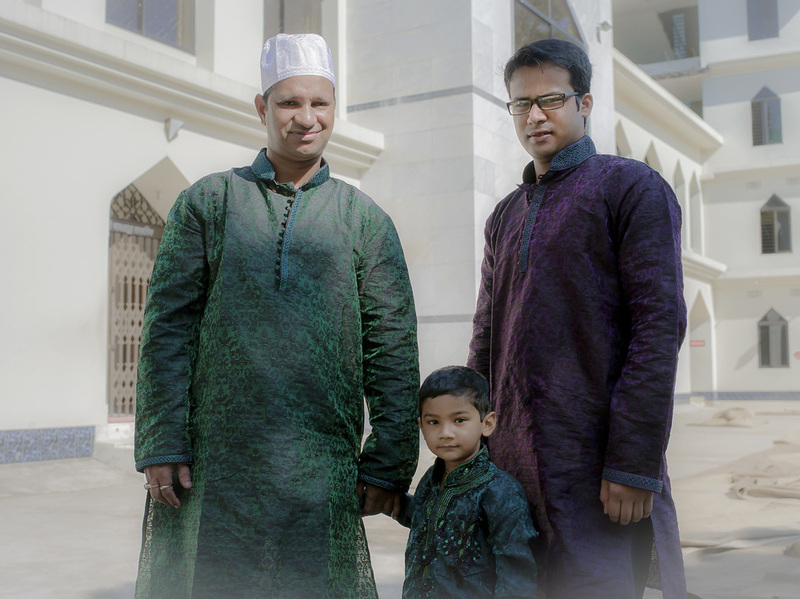 My experience of Bangladesh was unique and beautiful. 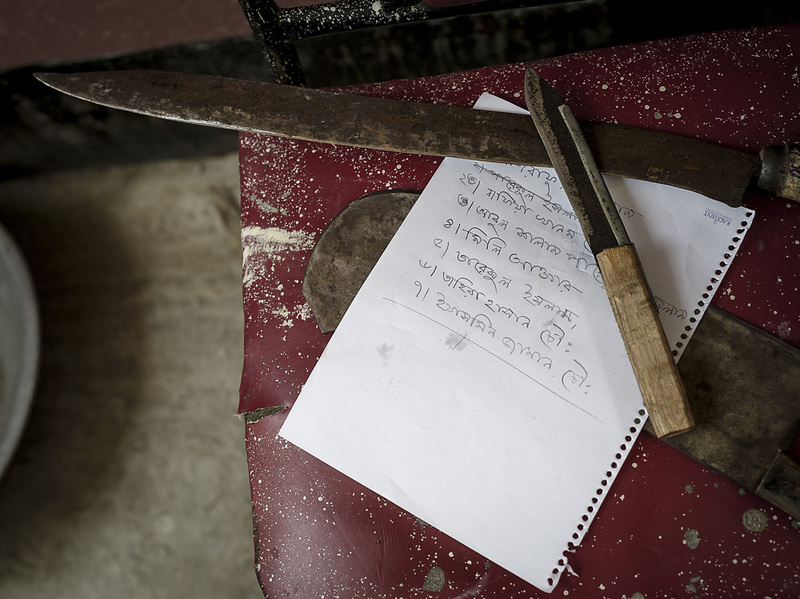 I still have so much to learn and photograph in Bangladesh. This country is definitely underdeveloped and polluted, but the people I saw are dedicating themselves to improvement, even though they may not have the most modern equipment or safest methods. I believe Bangladesh is doing a great job with very limited resources through incarnating materials. As in other communities I have been privileged to photograph, I am inspired by people who are willing to collaborate and create a vision to lift themselves and their community to another level. 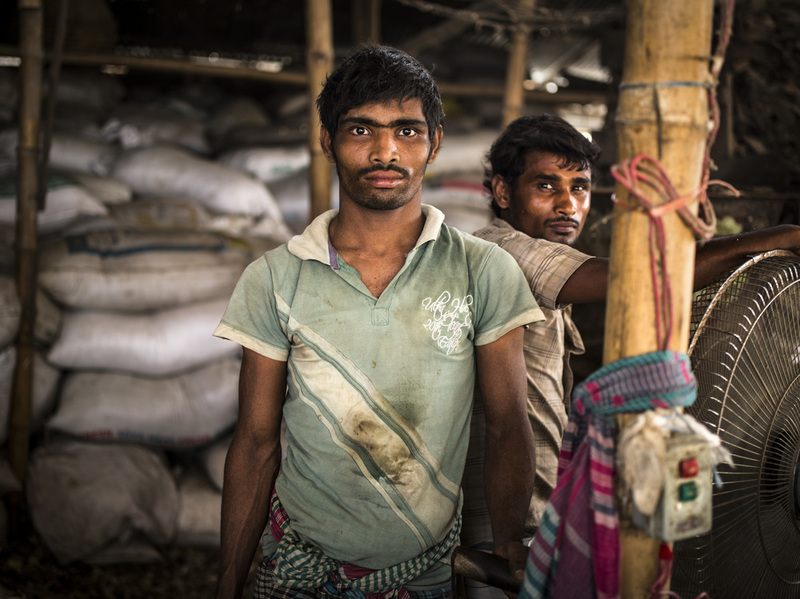 These humble, hard workers of Bangladesh deserve a cleaner and safer work standard; a better quality of life to compliment the quality of work they put into it. With the population increasing, it only creates a higher demand to produce higher results. Outcomes that require more jobs. Jobs that keep everyone at the same quality of life. 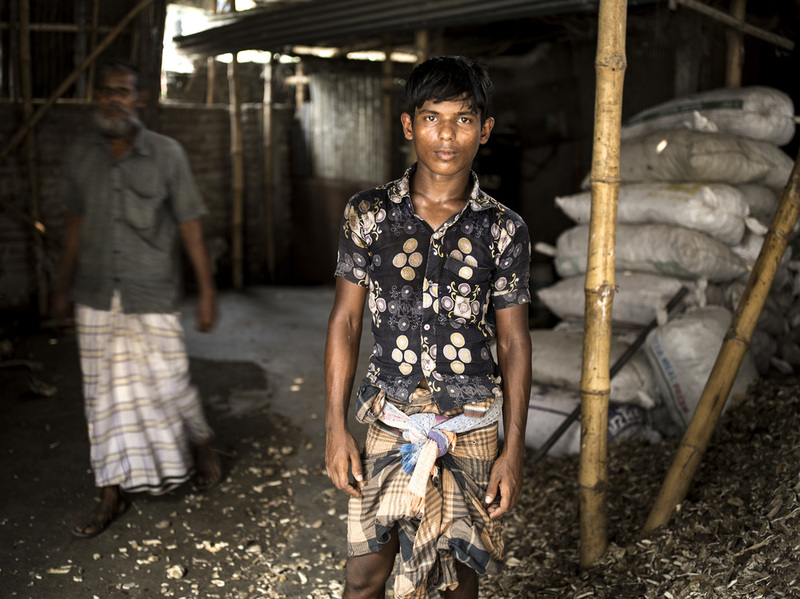 Many unfavored predictions can be concluded, but what I left with is that the people of Bangladesh have a humble, persistent and strong work ethic that will keep them in control of their own future.